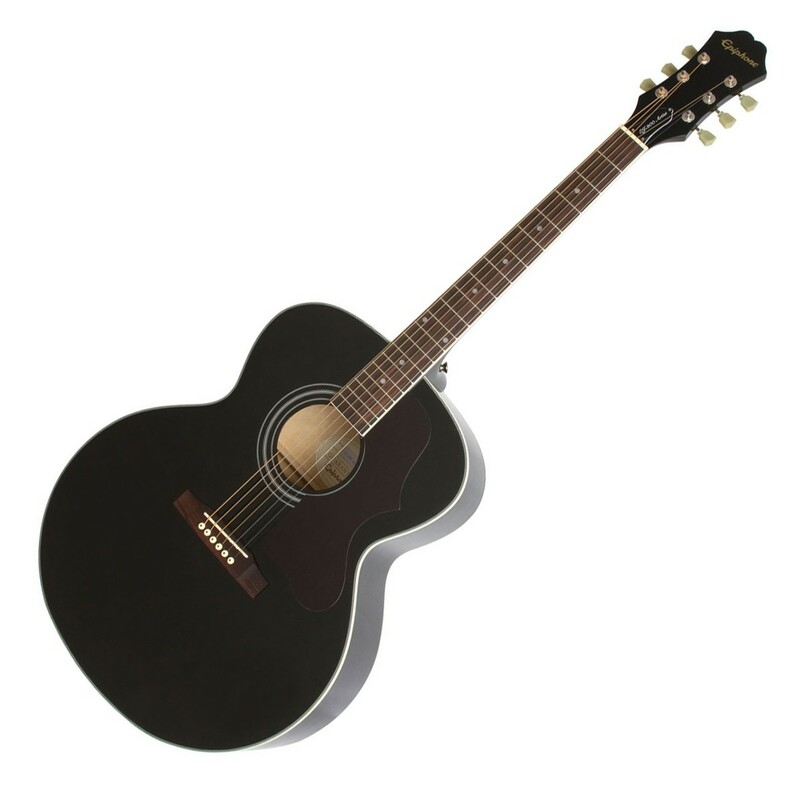 The Epiphone EJ-200 Artist Acoustic, Translucent Black pays tribute to the iconic Gibson J-200, and delivers high quality performance with a lower price tag. The EJ-200 Artist is constructed with select maple body which delivers exceptionally bright tones with sustain, while the adjoining solid spruce top delivers crisp, tight highs. The curvaceous Jumbo body of the Epiphone EJ-200 provides good projection and a full-bodied tone that accommodates for both stage and studio use. With a set-in maple neck and rosewood fingerboard, the EJ-200 Acoustic Guitar yields punchy highs with a soft, articulate low end. The EJ-200 Artist Acoustic is complete with a translucent black finish, and a contrasting pickguard that ensures its appearance stands out as much as its sound. The EJ-200 is known as 'The King of the Flat Top Guitars', and provides a huge sound with plenty of sustain. The back and sides are crafted from maple, which delivers a beautifully bright sound that dominates in the mid and treble ranges. The maple is topped with solid spruce which enhances the tone with crisp highs and tight lows, to create an overall balanced sound packed with plenty of punch. The EJ-200 features a smooth maple neck which enables fast and comfortable playing, ideal for a variety of playing styles and techniques. The maple neck yields bright and twangy tones as well as excellent clarity and ringing sustain, while the rosewood fingerboard creates bright sounds with warm lows.